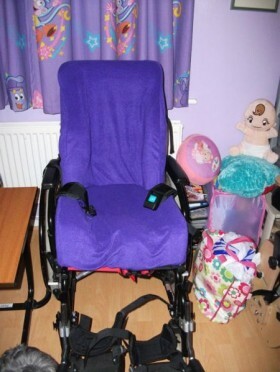 After many trips to medical engineering we have at last got Paige a chair that she can comfortably go out in, she can also take part in things a lot easier now, as she is a good height to see things and talk to people. We went into town and it was great to not have to be pushing her back into her chair because she had leaned over to far or to hear her complain about her back aching, she loves it. The chair has two special seat parts which have been molded to fit Paige’s body in a very heavy foam which is then backed with a hard plastic shell this keeps her in place, giving her the correct support so she can sit upright, the bottom seat has been designed to support her hip problem, although it is a big piece of kit it is wonderful to have it, she is now looking forward to many happy outings in it. It has taken a lot of support from our OT and Physio to push for us to get the correct seating, also Joanne was not afraid to say what she had been given was hopeless, so do stand up for what you need and do not be afraid to fight for it, it is worth it in the end. Previous postFight For Our Forests! Next postCrystal Bay Sauvignon Blanc.